December 12th is the Day of honouring Guadalupe. 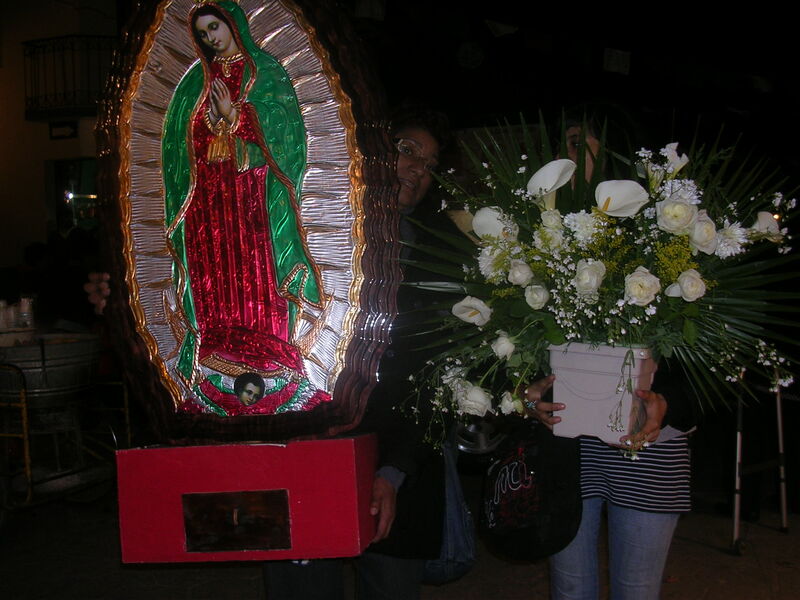 She is the Mexican version of mother Mary. The belief here is that she appeared to Juan Diego, an indigenous man and her image was imprinted on his cloak. This happening cemented the Catholic religion inMexico. It is very beautiful as the people dress up in traditional costumes. The little kids are so cute. They are dressed up as little Juans or little Guadalupes and are taken to the church to be blessed. Their parents are so proud of them. You just have to show a droplet of interest and big smiles open up everywhere. For the week before, processions and pilgrimages arrive. Some come here from other places and live like gypsies in the back of trucks. It’s like a weeklong party. 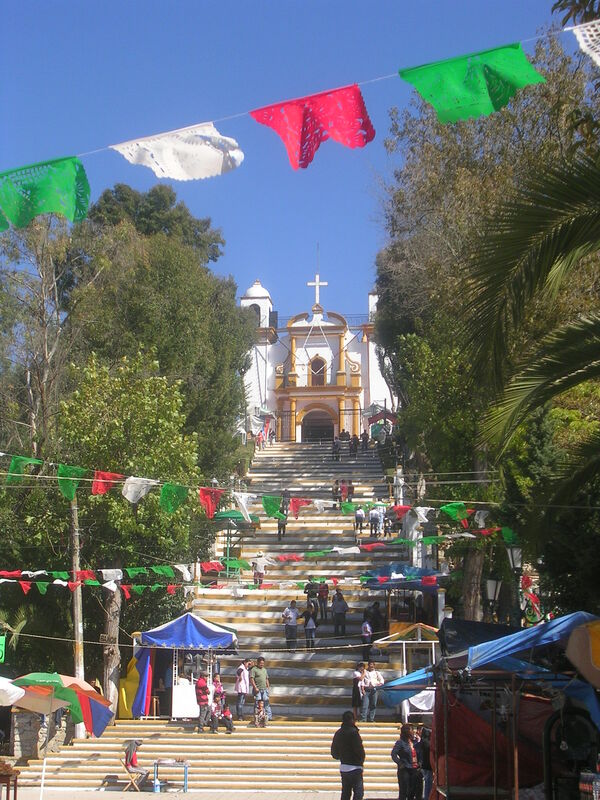 The church dedicated to Guadalupe is on top of a hill with lots of stairs leading up to it. Everything is decorated beautifully with cut-out coloured paper banners, flowers and lights. At the base of the stairs there is a fair set up with carousels, ferris wheels, and dumb games that you can’t win at. And of course – many, many food booths. Saturday seems to be a night of beer as there were beer booths set up all over the walkway for about 8 blocks up to the church. Drinking in public doesn’t seem to be a problem here. So the parents have a few wet ones, while the little Juan Diegos, still in full costume, play the ripoff games at the fair. Part of the celebration involves blowing off firecrackers in the street amongst all the people. They just shoot them off in the street indiscriminately. I learned this the hard way when suddenly I heard a sound like I’d been shot. I was only a few feet away from being ‘exploded’! The thing that has really moved us is the young people. 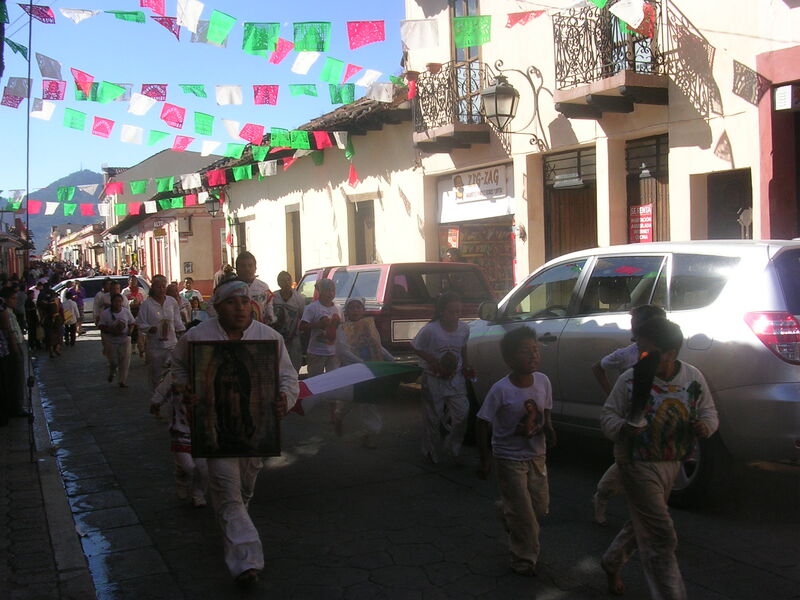 Most of the processions are teens and young adults – mostly male – dressed in their Guadalupe – Reina de Mexico – shirts with bandanas on their heads and singing ‘The Guadalupana’ at full voice. When they get near the door of the church, many get on their knees and shuffle all the way to the front altar like that. These are not kids doing this to satisfy their parents; these are kids living their faith. Pretty amazing to see. We are accustomed to the pilgrimages & processions in Mexico being mostly older women, but that certainly isn’t the case here in Chiapas. It is a day of excitement. Even the taxis and motorcycles dress up to honour Guadalupe. Aztec dancers join in to the mix and the Indigenous people are all in their finest clothing to participate as well. Catholicism and paganism are both very present in the religious celebrations. I have been curious about a couple of things: Why are there processions arriving days before Dec 12th? Where do they come from – and where do they go afterwards? Why are they coming from different places? What’s happening? Well, a Mexican lady kindly explained it all to me. It’s like a pilgrim exchange. Various groups walk from here to other cities and other states to visit their churches and the people from those communities come here. Then everyone returns to their own home church on Dec 12th. What is amazing is that they travel great distances – for example from San CristobaltoOaxaca- and toMexico City. Walking most of the way! With a lit torch that someone runs along the side of the truck with. On one occasion, it was a Chamula woman in her full sheepskin clothing! The people return with the clothes they left in, dirty, tired and often limping (many do the trek in bare feet.) A group of children went from here to Comitlan overnight. It is about 2 hours by car, but a lot more on foot. They walked partway and rode partway. The teens walked almost all the way. 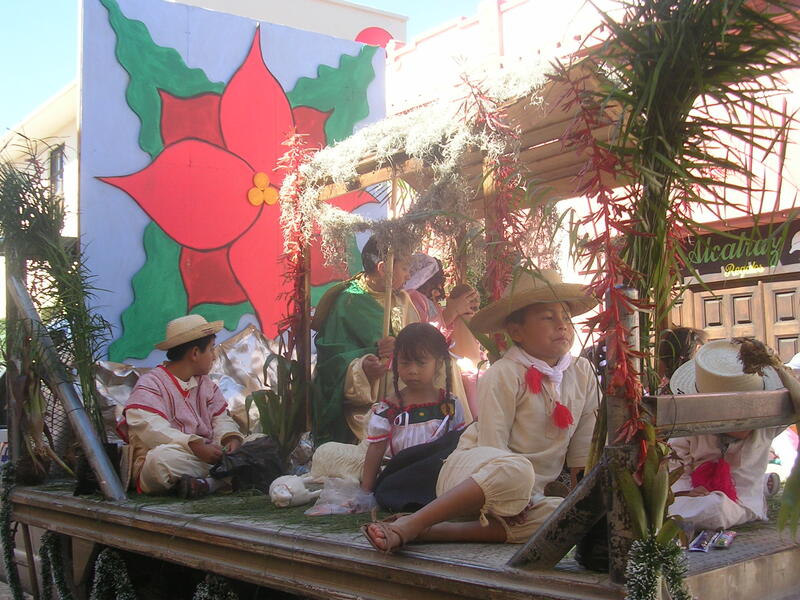 All the participants that had travelled long distances returned – most between 3 and 4pm – to celebrate this special day inSan Cristobal. The center of town was full of people welcoming them home. Party time!!! Sue many congrats on another great travel blog – tks for sharing your observations and experiences – as I do my own exploring and experience my own many adventures I realize the scope of “Exploring The Many Facets of Mexico & Its People” could be a lifelong challenge that mite not be completed – so – I’m more than happy to piggyback off your blogs & enjoy thru the “Inquisitive Spirit” what you’re seeing that I likely will not see – & so as always keep up your usual fine work!! I am enjoying re-reading your earlier posts as well as the latest – & of course Pete & I do envy your obvious excellent grasp of Spanish – it does make a “world of difference’ haha!!! ! !Felicidades muchos en un trabajo bien hecho (as always).